A cowboy "action figure" who leads his fellow toys bravely. Andy's treasured toy cowboy and the de facto leader of the other toys. He took the initiative in getting to the bottom of their strange new circumstances. "If that guy had something to do with our friends vanishing, then he's our problem too." 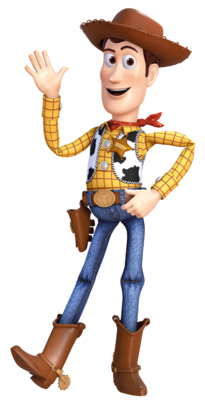 Woody is a toy based on a sheriff from Toy Box who is a party member in Kingdom Hearts III. He originated in the Disney/Pixar film Toy Story. The proposal folder shown to Buena Vista included plans for a world based on Toy Story in the original Kingdom Hearts. For Kingdom Hearts II a model of Buzz Lightyear and Woody were created for a similar purpose but according to the series' director Tetsuya Nomura, there was never a chance to present them to Disney so the idea was scrapped. Both the world and the characters finally made their appearance in Kingdom Hearts III as party members in Toy Box. Along with his friends Buzz Lightyear, Rex, Hamm, the Little Green Men, and the Green Army Men, Woody is taken away from his owner Andy and trapped in a replicated version of his world by Xehanort to experiment on the nature of their hearts. Woody joins his fellow toys on Andy's bed, as they prepare to take on the intruders that have appeared in Andy's room. They plan to spring upon the intruders on Woody's count; however, Buzz stops his friends, as three new toys, Sora, Donald Duck, and Goofy, have shown up. The trio defeat the Heartless and introduce themselves. Buzz, suspicious of the newcomers, demands Sora tell him where he had fought the Heartless before. However, his interrogation is stopped by the others, who believe Sora, Donald, and Goofy to be Andy's newest toys. They plan to search Galaxy Toys for Xehanort. At Galaxy Toys, Xehanort appears and summons Heartless to pilot the Gigas toys against Sora. The toys are split up and Woody helps to reunite everyone. Once all of the toys are recovered, they decide it is time for them all to return home. However, before they can leave, Xehanort appears once more, summoning a Marionette to possess Buzz, whose heart had been weakened by fear and doubt. Buzz turns his laser on Woody and attacks. Though Goofy, Donald, and Rex try to stop him, he disappears into a Corridor of Darkness. Woody and Sora try to convince Xehanort to set Buzz free. Sora and the others track down another dark corridor in the toy store, finding Buzz inside trapped in a column of darkness. Xehanort muses on the darkness in Buzz's heart, but Woody responds by describing the love between the toys and Andy. His connection to Buzz breaks the darkness trapping him. The darkness takes the form of the King of Toys, but Buzz regains his senses and helps Sora defeat it. Though the toys remain trapped in the alternate world for the time being, they remain hopeful of seeing Andy again and do not regret the chance to meet Sora and his friends, who have become a part of their hearts. Some time after Xehanort's defeat, Woody is seen with the other toys in Andy's room as the door finally opens with Andy's return. Woody is a thin ragdoll-style toy with a plastic head, hands, and boots. He has pale skin, brown eyes, and brown hair, over which he wears a brown plastic cowboy hat. He wears a red-patterned yellow shirt with folded cuffs and silver buttons under a black and white cow-skin vest on which his sheriff badge is pinned. He wears dark blue denim pants with a brown belt and gun holster buckled with an ovular tan buckle, and brown boots with tan spurs. There is a red bandanna tied around his neck, and a white ring on his back, attached a pull string. His arms and legs are stitched flat to give him elbows and knees. The name "ANDY" with a backwards "N" is written on the bottom of his right boot in black marker. "Yeah, I am a toy. And a friend. My guess is no one's ever loved you before. Because you know NOTHING about hearts and love." Woody is very trusting of Sora, Donald, and Goofy, far more than Buzz. He is very attached to his friends and cares for their safety, especially Andy. When upset, Woody is shown to be very stern, such as ordering Xehanort to return Buzz to normal, then to get lost. Woody feels that Xehanort is hollower than any toy. Hamm claims Woody is always getting into trouble. Sheriff Woody Pride first appeared in 1995, in Pixar's first feature film Toy Story in 1995, voiced by Tom Hanks, and has since appeared in its sequels, as well as several television specials and shorts. Outside of the films, he is voiced by Tom Hanks's brother Jim Hanks. In the 1995 film, Woody is the beloved favorite toy of a boy named Andy. When Andy receives a Buzz Lightyear action figure for his birthday and begins to spend more time with it than with Woody, Woody becomes jealous and fears he has been replaced by the space ranger toy. He attempts to hide Buzz from Andy, and in the process, he gets them both lost and in the possession of Sid, the toy-torturer who lives next door. In Sid's house, Woody finally admits his insecurities to Buzz and a friendship forms between them. They team up to escape Sid's house and manage to make it back to Andy before he leaves them behind in moving to a new house.